Healed of Chronic Fatigue: Ailin de Jager (28) from the island of Karmøy was healed of Chronic Fatigue when Svein-Magne Pedersen prayed for her at the alternative health fair in the city of Kongsberg in 2009. 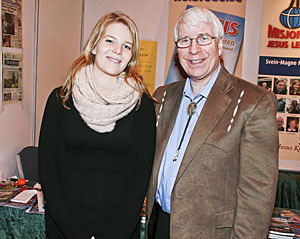 The picture was taken at he alternative health fair in the city of Bergen, March, 2011, when she came to tell Svein-Magne her story. Ailin de Jager (28) from the town of Avaldsnes on the island of Karmøy was only 14 years old when she was diagnosed with the serious ailment, Chronic Fatigue. The doctors thougt it could be a result of her earlier having had Mononucleosis. She had for more than ten years struggled with this chronic ailment. -It was a struggle to chew. -I went through periods of being bedridden or lying on a mattress on the floor in the livingroom without light or noise around me. I couldn't be bothered to talk or eat. My mother had to mash up my dinner, so it was the same consistency as baby food, enabling me to swallow it, she tells. During those times, she found light and noise intolerable. -I have been in better shape in certain periods, but I was never well. I felt as if I had the flu, at best. All the time, it was as if I had fog in front of my eyes. I was constantly lacking energy, and each time I had a good period, it never lasted for a long time. She was often admitted to the hospital, especially during the first years of having the ailment. -When I was 15 years old, I considered the hospital to be my home away from home, Ailin tells. But it took a very long time for the doctors to be able to find out the root cause of the fatigue. She was amongst other things checked for lymphoma, because many of the symptoms were similar to that. When she turned 20 years old, she came to a doctor who had worked a lot with Chronic Fatigue, who also recognized the ailment and diagnosed her. In spite of the ailment Ailin struggled her way through high school, and afterwards she signed up to get into Høgskolen in Telemark in the city of Notodden. She defied the well meaning advice from the doctors and NAV (the social security office), who said that this would be too much for her. -I have always had a «Never give up» attitude. I was not going to let this ailment get the better of me and refused to give up. I sacrificed a lot to be able to go to school. I was not able to do anything else when the school day was over, because then I had to go home to rest to gather strength to get through the next day, she tells. In Notodden she started taking a dietary supplement that was recommended by others who had Chronic Fatigue. This was something that she found gave her more energy to help her manage everyday life. -But this did not make me well, she clarified. On the weekend of April 17-19 there was an alternative health fair in the city of Kongsberg, and Ailin heard that Svein-Magne Pedersen was going to be there to pray for sick people. When this took place, Ailin was in her second year of her of stydying to become a teacher in the city of Notodden. Kongsberg was only half an hour's drive from Notodden. - I had to take advantage of this opportunity. I have to go there to receive prayer, she thought. -I was very nervous at the thought of going there, because I did not know what to expect, she says. At the alternative health fair people were standing in a queue waiting to receive prayer from Svein-Magne. Ailin let one after the other in front of her, since she figured that others were probably worse off than she was, Finaly it was her turn, and Svein-Magne prayed a short prayer for her. -I have taken notice of you, and I wish I had more time to pray for you, But God will help you regardless, she recalls him telling her. -When I sat down in the car to go home, tears began to run down my face. All the way home, I could not stop crying and I understood why. At the same time I felt more lighthearted and happier, she tells. -After getting up the following day, it was as if a window wiper came in front of my eyes and wiped away the fog that had been there ever since I got Chronic Fatigue. I was sitting in my living room and watched the fog disappear. From then on I began to thank Jesus that I had been healed, she tells. In the days that followed, she noticed that she no longer needed to rest after coming home from school, and that she felt rested when she awoke in the morning. Her breakthrough was finally here, and the process of her being totally free from the sickness was starting to happen. Gradually she was completely healed. -In the course of a year and a half, all the symptoms of Chronic Fatigue disappeared. I went to NAV and told them that I was well and did not need support from them anymore, she says. -There is no other explanation, other than that I have been healed by God, she points out. She had namely stopped taking the nutritional supplements after the weekend in Kongsberg, because she believed that God had healed her. She finished her studies and moved back home to the town of Avaldsnes. -When I occasionally get the flu, the same as everyone does, what comes to mind is «This was how Chronic Fatigue used to feel like when I was at my best.» I often thank Jesus for healing me, she says.